Enter the legend! The catalogue of the Danish publisher Louis Poulsen lighting includes all iconic Scandinavian design: the suspension of Poul Henningsen Artichoke, ''AJ'' collection of Arne Jacobsen's famous ''light'' Panthella signed Verner Panton and many other masterpieces on display in the most prestigious museums in the world. For over 70 years, Louis Poulsen collaborated with architects and designers the most visionary of their time. Besides the legends of the Twentieth Century, the Danish brand knows how to stay in tune with the times surrounding himself with talented contemporary designers and imaginative as Louise Campbell and Ross Lovegrove. While Louis Poulsen lighting fixtures are innovative at an aesthetic level, they are also at the level of lighting performance. 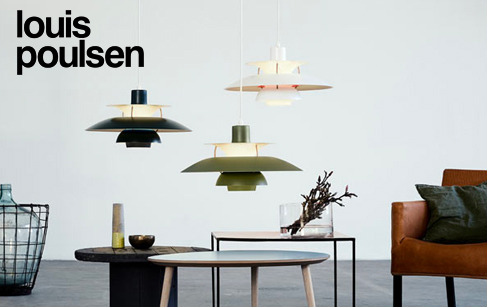 Quality, design and manufacture of Louis Poulsen lighting is the world famous Danish brand that has never wavered. Each luminaire is designed to provide perfect lighting, always pleasant and never dazzling. Infinite care is given to details (bulbs invisible wires surrounded by textiles, handmade ...) Louis Poulsen lighting fixtures do not just illuminate, they are designed to create a real mood light.